Calculation of Test results like Tapped Density, Compressibility Index and Hausner Ratio. Printer port for documenting test results as per GMP/ GLP standards. 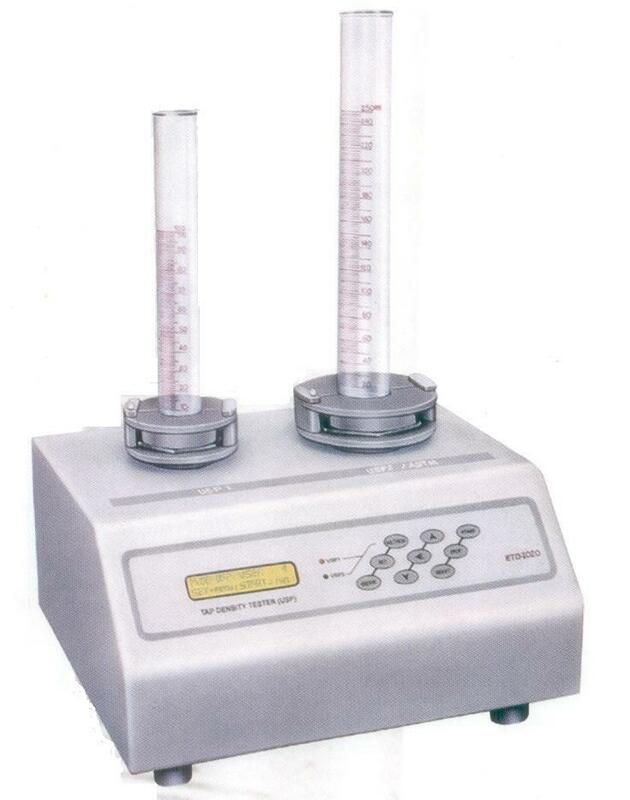 Microcontroller based Tap Density Tester ETD-1020 complies with USP and ASTM specifications. The unit offers a simple and standard means of measuring the tapped density of powders, granules, pellets, flakes and other bulk substances. The ETD-1020 is a two station tap density tester supporting both USP I and USP II methods of testing. The unit allows any one test to be performed at a time. The test can also be performed as per ASTM standards using the optional adapter for cylinder holders. Two different cylinder holders with snap-lock mechanism are designed to hold the 100 ml and 250 ml cylinders. To ensure a free drop of the cylinder from the required height, the two stations are provided with virtually friction-free bearings. Each station is directly driven by independent motors to ensure a maintenance-free drive. A simultaneous rotating and tapping motion minimizes any possible separation of the mass during tapping down. The test can be performed in two different modes USP mode and USER mode in both test method. In USP mode, test will run in selected method with set number of taps. At the end of the test, results like Tapped Density, Compressibility Index and Hausner Ration are calculated and displayed. A validation report can be printed at the end of the test as per GMP / GLP requirements which includes the test parameters, test results and actual time and date on which the test was performed. It also includes serial number of the instrument along with the entry fields for user name and product details. During the test the user is guided through a series of prompts on the LCD display. The on-line menus and status indicators make the operation of the instrument. The value once programmed is retained in the memory of the instrument. The unit has a power failure detection facility which allows the user to complete the remaining test after the power supply is resumed. 100ml cylinders (set of 6), 250ml cylinders (set of 6), Adapter for ASTM method for models ETD-1020 and ETD-20, Cylinder holders, Acoustic cabinet, Printer, RS 232 serial port. The acoustic cabinet reduces the sound level to 71 dB to meet laboratory standards.